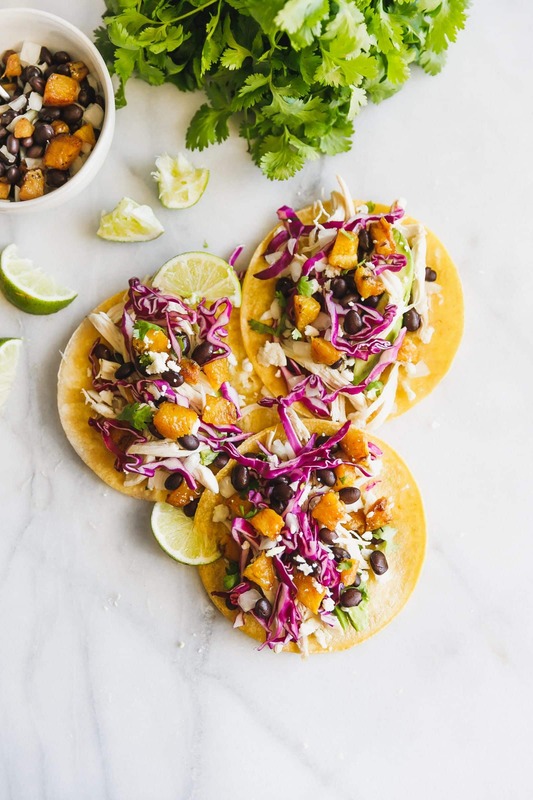 Flavorful chicken tacos made with a quick mojo marinade, an easy-to-make sweet plantain salsa, avocado, red cabbage, cilantro, queso fresco, and lime wedges. Great way to use leftover chicken! May I present you with…*drum roll please* your next quick + easy meal! Yes, my friends, these mojo chicken tacos are one of those “WHAT DO I MAKE FOR DINNER” type of dinners. It’s one of those “WHAT DO I DO WITH ALL THIS LEFTOVER CHICKEN” kinda dinners. It’s also one of those “OMG THIS WAS SO EASY AND DELICIOUS” type of dinners too. Guys, what I’m trying to say is just go ahead and add this recipe to your rotation this week, k? mojo chicken: basically shredding up your leftover chicken (or totally cheating and picking up a rotisserie chicken on the way home) and mixing it with lime juice, orange juice, garlic, salt and pepper. A more elaborate mojo marinade exists here but this one? This one’s a quick and dirty version and just as delicious! 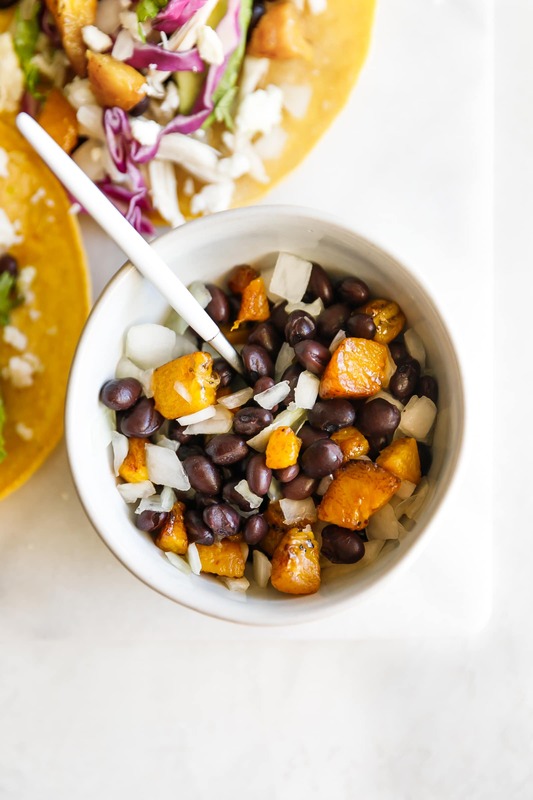 sweet plantain salsa: a very ripe plantain that looks black and rotten gets peeled, sliced and pan fried with coconut oil to result in a deliciously sweet plantain salsa that’s mixed with black beans, chopped onions, lime juice, lime zest, salt + pepper. See why you can’t judge a book by it’s cover? tacos! : need I say more? You pan fry the chicken a little, you know to get things hot and juicy Ooo. You make the sweet plantain salsa and then throw everything in a corn tortilla! Toppings like sliced avocado, shredded red cabbage, crumbled queso fresco, chopped cilantro, and more lime, of course. Feel free to add more toppings of your liking. The beauty of tacos is that you can create your own adventure. Taco night has never looks so freaking festive! I hope you make these and absolutely LOVE them. 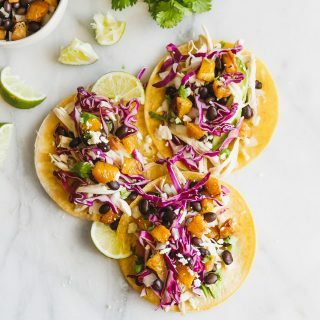 Flavorful chicken tacos made with a quick mojo marinade, an easy-to-make plantain salsa, cilantro, queso fresco, and lime wedges. Great way to use leftover chicken! In a bowl, add lime juice, orange juice, garlic, salt and pepper together. Add chicken to the bowl then place in the fridge for 20 minutes to marinate. In a hot 12-inch nonstick skillet, add 2 tablespoons coconut oil. Pan fry the chopped plantain for 2-3 minutes at medium heat until they have browned. Transfer to a paper towel lined plate to drain. Chop into small pieces. In the same skillet, wipe clean. Add remaining tablespoon of coconut oil and pan fry the shredded chicken for 6-8 minutes over medium high heat. Set aside. In a bowl, add onions, black beans, juice from 1 lime, zest from 1 lime, salt and pepper. Stir to combine. Add chopped plantains and gently mix together to combine. 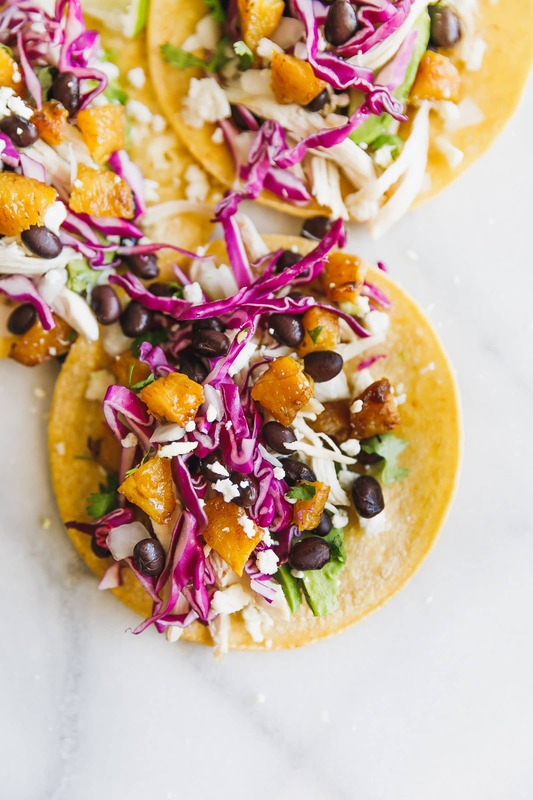 To assemble tacos, divide chicken evenly over warm corn tortillas then add avocado, red cabbage, plantain salsa, cilantro, and crumbled queso fresco. Serve with lime wedges and ENJOY!